I live a few blocks from the famous Roscoe’s Chicken and Waffles in Hollywood and drive past it pretty much every time I leave my neighborhood. 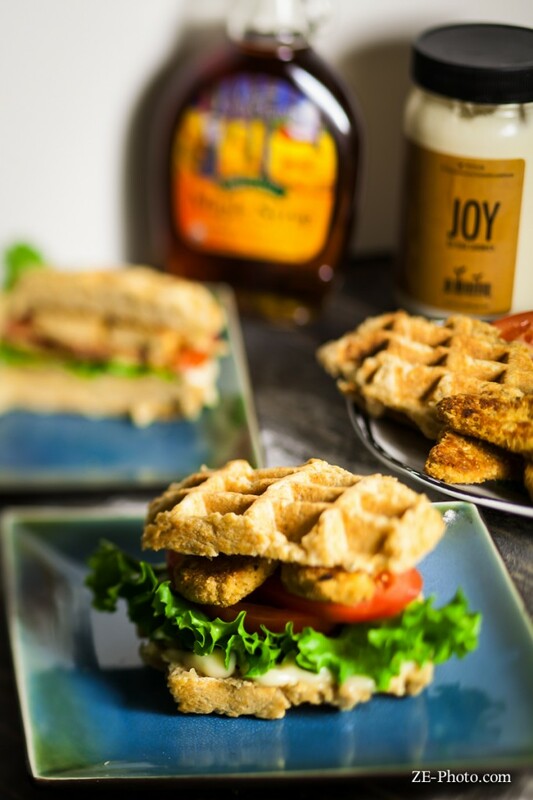 Though I have never actually eaten there, the popular combo of sweet maple drenched waffles and savory fried chicken (vegan in my world, of course) has always intrigued me. There are vegan restaurants in L.A. that serve a version of this dish, but I have never actually ordered it. It seemed a little too decadent for me, like a little too much of a good (yet totally bad) thing. That’s a lot of non-green food on one plate. But still, that intrigue had buried itself deep into the depths of my mind until the right time presented itself for it to resurface. I don’t know what exactly sparked my memory, but last week I recalled the very first vegan dish I made on the very first day I went vegan almost 3 years ago now: Belgian Waffles. They were good. A little dense and not overly sweet and I remembered my husband describing them as waffle shaped bread. Lightbulb. 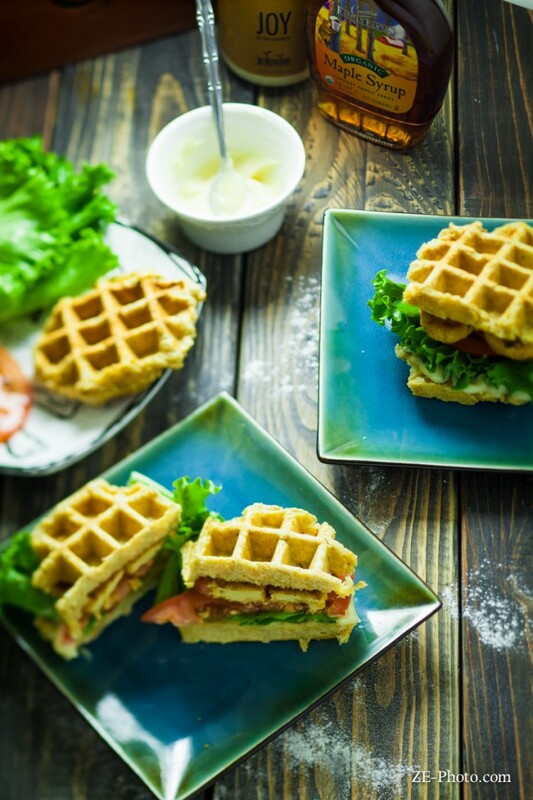 What if I could make those waffles again and use them as bread for a mouth watering chicken sandwich?? That way I could add some lettuce and tomatoes and not feel completely guilty or over-indulgent: genius. So that’s exactly what I did. I made those Belgian Waffles again, only this time I left out the apple sauce and almond extract to make them even less sweet. After cooking I let them cool a bit and then sliced them lengthwise to have two pieces of “bread”. 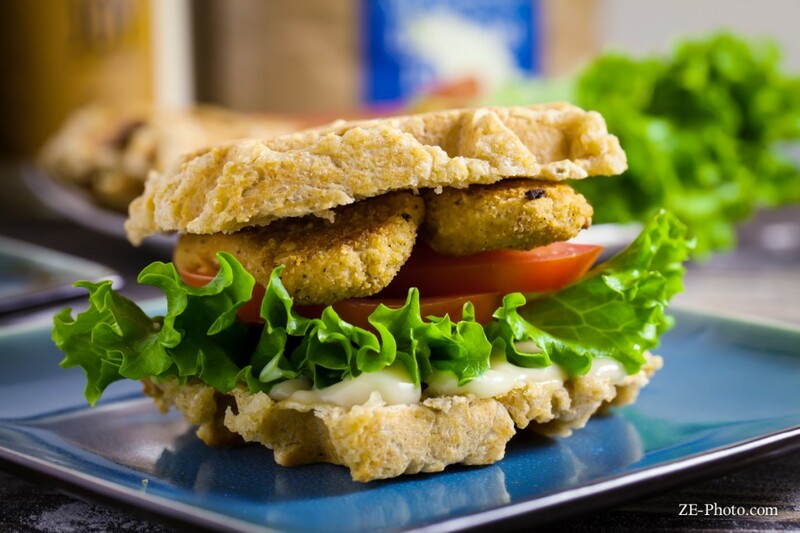 I cooked up some of my favorite Gardein Seven Grain Crispy Tenders for the “chicken” part of the sandwich. 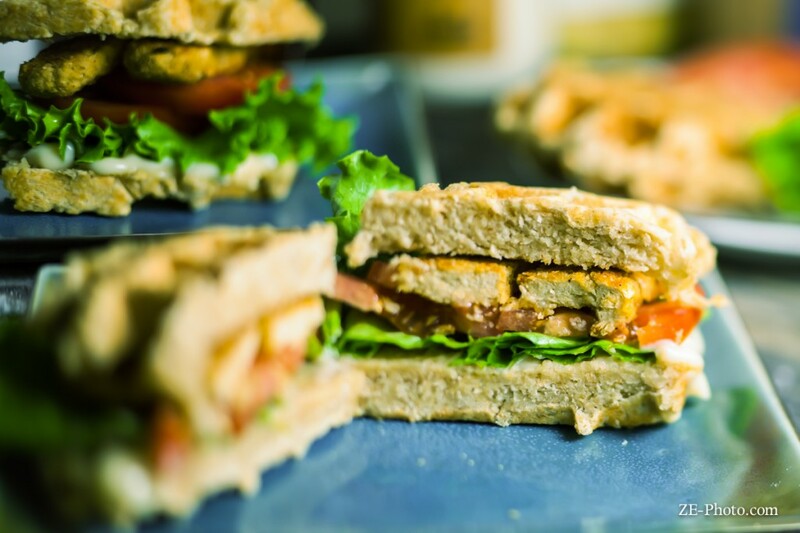 Sliced up some organic tomatoes, tore up a few big leaves of green leaf lettuce and then added the final touch which was absolutely the element of this dish that tied it all together and made it one of the best damn sandwiches I have ever had: maple mayo. Oh yeah, you read that right. All I did was take 2 parts vegan mayo and 1 part maple syrup and mixed it all together and spread on each slice of waffle. Heaven. HEA-VEN. I’m always surprised when something I make turns out tasting good, let alone amazing. So I was patting myself on the back as I was scarfing this thing down while wishing I had made a second one for myself. It had the perfect blend of sweet and savory and the veggies added wonderful texture and freshness. Just writing this is making me drool a little. I have a feeling this will become a frequent brunch dish in this household and I’m not even remotely sad about that. What is your favorite go-to brunch dish? Tell me in the comments below!